The Rangers have confirmed that they have signed both Chris Drury and Scott Gomez to free agent contracts. 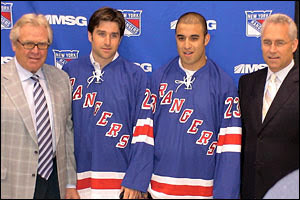 Gomez, formerly of the NJ Devils is now a New York Ranger for seven years at $51.5 million and Chris Drury, former Co-Captain of the Buffalo Sabres, is now a NY Ranger for five years at $35.25 million. Dellapina is also saying now in Blueshirts Blog that the Rangers in the hunt for Sheldon Souray, although a big contract for Drury might make that impossible under the cap. The Hockey Gods have spoken, um...I mean Glen Sather. If I have to live with Scott Gomez "the superstar" from New-Jersey throughout the next seven years of contract as a Blueshirt, I will be thrilled. 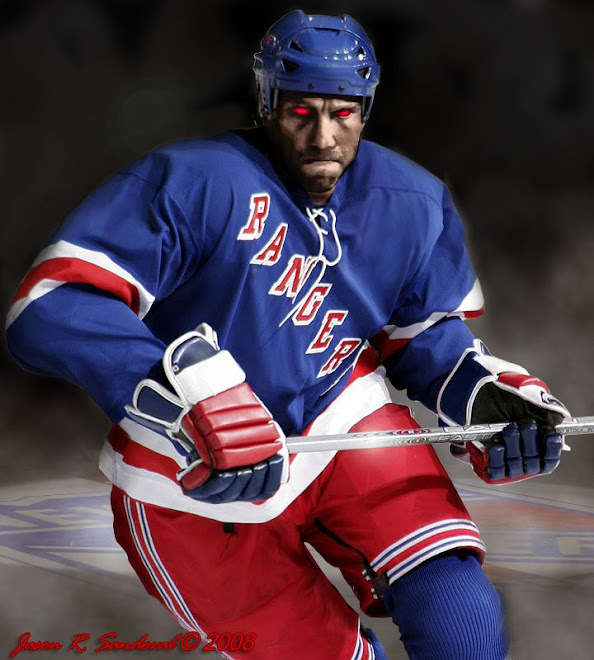 If I have to live with Scott Gomez "the Devils System Player Who Underdelivers" throughout the next seven years as a Blueshirt, I will be one angry Dark(er) Ranger than ever before. Echoes of "Lindros as Philly Flyer" ring in my head over and over. Never thought Gomez was worth this money and, especially a 7-year contract, but...in the spirit of acquiring two of the top three free agents, I am happy and less-Dark for the moment. May I be surprised. Now Drury on the other hand....welcome! Jed Ortmeyer is now a Nashville Predator. At the time of this writing, all of the following need to stay a NY Ranger -- Henrik "the King" Lundquist is still unsigned, Sean Avery the firecracker is not yet signed, Brendan Shanahan is not signed and then there is Michael. This team keeps improving...my season tickets are beaming! LET'S GO RANGERS!!!!!! LET'S GO RANGERS!!!!! !this is a huge boost for NYC, the Islanders and the Devils don't have a shot and the Flyers may ahve a shot for the division next season. They paid too much for Briere, as Drury is the top choice. We wanted Drury...Schneider is now onboard as neidermayer may be retiring...killer defensive move. 2) The Drury signing is also quite abit, but he brings more positive intangables. Still the team is in need of a defense upgrade, and Souray is NOT the answer! Chemistry with Jags will be the answer for either of these centers. He was quoted this morning saying Scott Gomez was appropriate as his center and Drury on the second line centering Shanny (providing he is signed). One of the misconceptions about the Rangers cap limit is that they are currently sitting on $36 million committed in payroll, plenty enough for them to make deals with Lundquist (a substantial deal), Avery, Hossa, Prucha and Shanny. Defense right now is scary -- and Souray is not the answer. The Lundquist conspiracy is scary! I give Sather two days to lock 'em up. If he jumps, The Dark Ranger will play the net. Ranger's fans should be cautiously optimistic. They had good signings, but if Gomez turns out to be a dud that 7-year deal is going to kill them. Lundquist wants to be in New York, but he is receiving offers for an extended contract elsewhere. Sather has a meeting tomorrow to match and discuss the fans, the nostalgia, the Cup....Brendy is gone. Avery will be gone. Current Rangers are pissed at the money promised and there is money to be made elsewhere. Ryan Smith left for the money.jason blake left for the money. gomez left for the money. briere, durry, all of them. this is a brutal free trade, and the Rangers are forward,center-strong, with no defense strength -- what? dan Girardi? -- and if your "king?" is gone, Weekes is sitting pretty for a payraise as your now #1 option - bitter for the spotlight and now demanding higher salary. conundrum? huge. ff...you are obviously a Rangers-hater, and you couldn't be further than what will happen. This is a team that wants to finally play HOCKEY together. the addition of the two top free agents should only enhance what is already there.